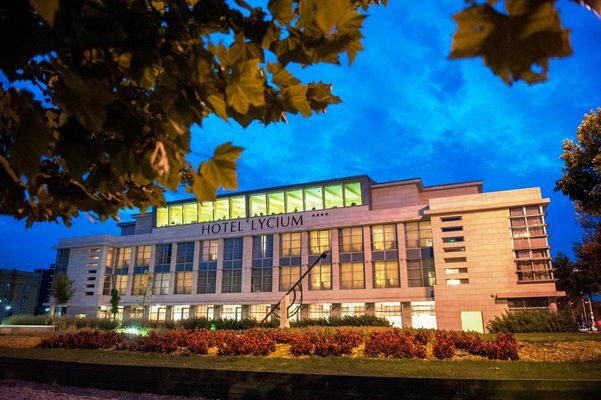 The Hotel: Hotel Lycium was erected in the heart of Eastern Hungary's most dynamically developing city, Debrecen, as set in the direct vicinity of the Great Church and Déri Museum. 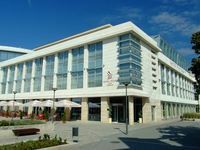 The hotel itself is located in the unique business and conference complex of the region, the nearly sq m 13,000 Kölcsey Centre. Rooms: Our air-conditioned hotel awaits the guests with 88 non-smoking double rooms and 4 apartments, a total capacity for 192 persons, with all the related furnishing, facilities and service standards perfectly designed for the needs of business travellers. The rooms have been provided with specially designed internal terraces to offer pleasant scenes of relaxation, pastimes. Átrium Restaurant: Being an excellent location for public events, this restaurant with its total capacity of nearly 200 people offers the gastronomic specialties of the Hungarian and international cuisine, including seasonal and reform dishes, dietary meals. We can guarantee both for the hotel guests and the townspeople, as well as for those visiting Debrecen to have particular gastronomic experiences the real enjoyments of "the pleasures of the white table". Our gold-class chefs and their teams have extensive knowledge on culinary trends and proper international experience, thus their unique menus perfectly represent the catering profile of the hotel. Apart from buffet meals, guests and also visitors wishing to have some special gastronomic adventures are attracted by a wide selection of a la carte dishes. Wellness: Naturally, we have considered the needs of guests looking for recreation, relaxation. Both business travellers and families trying to have some days off are awaited for in the nearly sq m 400 Wellness Centre on the upper floor, where the services are offered to grant refreshing moments. Our objective here is to make our guests completely forget the negative impacts they suffer from accelerated life and day-to-day stresses. Our relaxation and refreshing programs act for the revival of the mind and the body. • L'accessione d'Internet via cavo è raggiungibile in ogni camera. • Il garage è alla disponibilitá degli ospiti e costa 2500 HUF per macchina per giorno. • Per i bambini sotto i 3 anni offriamo l'alloggio gratuito nella camera dei genitori. Our air-conditioned hotel awaits the guests with 88 non-smoking double rooms and 4 apartments, a total capacity for 192 persons, with all the related furnishing, facilities and service standards perfectly designed for the needs of business travellers. Some rooms have been provided with specially designed internal terraces to offer pleasant scenes of relaxation, pastimes. Due to the presence of natural materials and the dominance of the blue colour, the four apartments reflect harmony. Apart from the living room and bedroom, each of the 4 apartments serves the comfort of our guests with a study, as well as a bathroom with both a shower and tub. • I prezzi non includono la tassa turistica (300 HUF per persona per notte).